MGen. Jet B. Velarmino AFP, 8ID Commander, and wife Imelda Velarmino unveil on August 16, 2014 the marker citing the efforts of the 19th Infantry Battalion in restoring its camp after the devastating ST Yolanda on November 8, 2013. 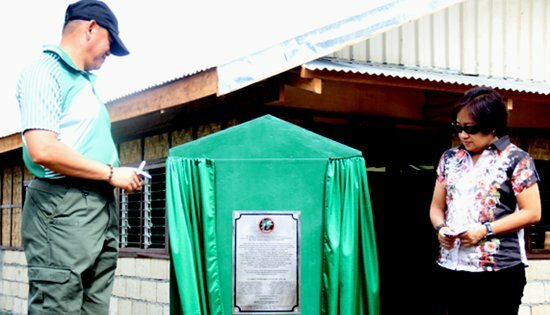 KANANGA, Leyte – The so-called home of the commandos in Leyte which was turned ground zero after Super Typhoon Yolanda, stood again with its reconstructed and newly-built facilities being inaugurated here on Saturday morning, August 16. The Inaugural Ceremony was graced by Maj. Gen. Jet B. Velarmino, Commander of the Army’s 8th Infantry (Stormtroopers) Division as Guest of Honor with some of his staff who came all the way from Catbalogan, Samar. MGen. Velarmino commends the leadership of 19th Infantry Battalion, with its commanding officer, Lt. Col. Nedy Espulgar who self-engineered the rehabilitation of their camp without compromising tasks mandated by higher headquarters. In his message, MGen. Velarmino said he can imagine how the battalion was destroyed when Super Typhoon Yolanda struck. Maj. Gen. Velarmino was himself a survivor and among those who have seen the face of actual disaster in Tacloban City when the devastating super typhoon hit. With Fr. Christopher Ligason, the officiating priest, MGen. Velarmino inaugurated half-concrete structures such as the camp’s admin building, liaison offices, dining park, supply rooms, guard post, people center, officers and enlisted personnel quarters, and chapel. The camp’s perimeter fences, organic garden and five (5) bay firing range were also rehabilitated. Lt. Col. Nedy Espulgar said his troops can fully focus on Internal Peace and Security Operations (IPSO), now that its camp is restored. Espulgar said the rehabilitation of their camp was started six (6) months ago when the frequency of humanitarian and disaster relief (HADR) operations in areas severely affected by ST Yolanda has dropped. “The timeline for our camp rehabilitation does not include our joint undertaking with the members of Joint Task Force 630 of the Australian Defence Force in December last year which resulted to the clearing of our camp from all debris and the reconstruction of some facilities like our mess hall, water system and comfort rooms”, Espulgar stressed. What we have built would not be possible without the helping hands of the stakeholders and friends who believed on our cause. This is not just a traditional military camp, but a home to peace-loving people. The Inaugural Ceremony was highlighted with a five-stages Inaugural Shoot Fest shoot which was participated by a total of 68 enthusiasts and members of gun clubs from Ormoc, Baybay, Kananga, Matag-ob, Tanauan and Samar. In attendance during the fun shoot were Leyte Board Member Allan Ang, Congressman Rogelio Espina of Biliran’s lone district, Mayor Elmer Codilla of Kananga, Vice-Mayor Michael Torrevillas of Matag-ob, and Superintendent Niel Montaño of Ormoc City Police. QUEZON CITY – “Butchers and cowardly generals like Jovito Palparan Jr. deserve justice – the kind that is commensurate to the number of civilian lives he and his men took and toyed with, while former President Arroyo and the military establishment were cheering him on. To play him up as the Armed Forces of the Philippines’ hero, to give him a minute longer to avoid prosecution, and then suggest to place him under military detention are all forms of travesty of justice. It encourages every person in uniform to do the same dirty deeds of Palparan,” Karapatan secretary general Cristina Palabay said in reaction to statements by former military officials and Sen. Antonio Trillanes over the week-end. This came after the recent arrest of Gen. Palparan last August 12 after almost three years of hiding. Palparan is facing two counts of kidnapping with serious illegal detention for the disappearance of two activists Sherlyn Cadapan and Karen Empeño. Two of his accused in the case, Army Colonel Felipe Anotado Jr. and Master Sergeant Edgar Osorio, are under military custody. Palabay said placing Palparan under military detention, just like his cohorts, is a tactic being used by the AFP for its men to evade accountability. “These are essentially like back-to-barracks orders, similar to what the AFP did with Lt. Col. Alexis Bravo, Lt. Dante Jimenez and 14 other members of the Army’s 27th Infantry Battalion who were responsible for the 2012 massacre of anti-mining activist Juvy Capion and her two sons,” she added. “The AFP’s protection of their own and their defense of the acts of butchers like Palparan as acts of duty are typical of the Philippine military, whose mercenary and fascist tradition and orientation breed generals like Palparan. They kill innocent civilians, massacre families, disappear suspected rebels, and sow terror in communities, in the name of counter-insurgency programs, which continue to happen under the Aquino government,” Palabay said. Karapatan today also called on the Aquino administration to enforce the views of the United Nations Human Rights Committee to prosecute and hold Palparan accountable for the killings of Eden Marcellana and Eddie Gumanoy. Marcellana, Karapatan Southern Tagalog secretary general, was abducted on April 2003 by soldiers under Gen. Palparan in Mindoro Oriental, while conducting a fact-finding mission on human rights violations perpetrated by Palparan and his men. All of the 11 members of the fact-finding team were abducted. They were eventually located in different jails, except for two, Marcellana and Eddie Gumanoy, a peasant leader, whose both bodies were found lifeless with gunshot wounds and torture marks. Witnesses point to the “Bonnet Gang,” a paramilitary group linked with the Philippine Army’s 204th Infantry Battalion of which then Col. Jovito Palparan Jr. was the commanding officer. Murder charges were filed against Gen. Palparan and his men for the Marcellana-Gumanoy killing but the Justice Department, then headed by Raul Gonzales, junked the charges. It was in 2008 that the United Nations Human Rights Committee (UNHRC) released its views on the case, after a complaint was filed by Karapatan and relatives of the victims, assisted by counsels from the National Union of People’s Lawyers. The UNHRC concluded that the Philippine government failed to protect the rights of Marcellana and Gumanoy and provide remedies for redress for the relatives of the victims. The Committee also urged the Philippine government to initiate and pursue criminal proceedings against Palparan and his men, and to ensure that such violation do not recur in the future. Palabay said there were 138 victims of extrajudicial killing (EJK) under Palparan’s watch, out of the 1,206 EJK victims during Macapagal-Arroyo’s term. Karapatan also documented 59 victims of enforced disappearances by Palparan and his cohorts, out of the 206 victims of disappearances during the past administration. QUEZON CITY – "Kumita na naman ang mga pulis at militar!" (The police and military just got richer!) Cristina Palabay, Karapatan secretary general said referring to the Philippine National Police (PNP) and the Armed Forces of the Philippines (AFP) who allegedly profited from the recent arrest of 60-year old Eduardo Esteban. Last August 5, 2014 in Jaro, Iloilo, Eduardo Esteban was arrested under a warrant for Manuel Esteban, an alleged ranking leader of the New People's Army in Ilocos-Cordillera. Manuel Esteban with aliases Bonnie/Jun/Bennie has a P5.8 million bounty which has just been rewarded for the arrest of Eduardo. Eduardo Esteban was at home in the morning of August 5 in Brgy. Buntala, Jaro, Iloilo City when joint elements of the PNP and AFP arrested him. The arresting officers showed a warrant of arrest for a murder charge issued by Judge Corpus B. Alzate of the Abra RTC Branch 2. Attached to the arrest warrant is an order from the said court, amending an information filed by the Provincial Prosecutor, "the name Esteban Manuel or Manuel Esteban appearing on the face of the information be changed to Eduardo A. Esteban to conform with the evidence/documents submitted to this Court." This order was dated June 26, 2013. Contrary to AFP Chief Gen. Gregorio Catapang’s statement on the arrest, Eduardo Esteban has retired from the Communist Party of the Philippines 10 years ago. Before his arrest, he was living with his family and owns a sari-sari store in his hometown in Iloilo. Eduardo Esteban has been suffering from diabetes and is a cancer survivor. In a statement issued by Communist Party of the Philippines, Eduardo Esteban was never part of revolutionary forces in Ilocos-Cordillera Region. "This is no different from the case of security guard Rolly Panesa who was arrested under the warrant for NPA leader Benjamin Mendoza," Palabay cited. "The AFP bagged P5.6M for Panesa's arrest," she added. After 10 months of detention, the Court of Appeals resolved that Mendoza is NOT Panesa and ordered for his release,” Palabay said. She also cited the case of farmer Olegario Sevas, who was arrested in December 2011 in Negros Occidental under the warrant against "Filemon Mendrez,” an alleged NPA leader. Anti-mining activist Romeo Rivera is also imprisoned and is facing several criminal charges filed against a certain “Felix Armodia,” alleged Front Secretary of the CPP-NPA. “All of these cases has an equivalent reward money which the AFP claimed," Palabay said. "The AFP isn’t contented with the billions of DAP it is receiving from BS Aquino. They still need to perform modus operandi arrests to get more millions," Palabay said. "Etong mga rumaraket ng reward money ang dapat na nakukulong kasama ng mga magnanakaw ng kaban ng bayan (Those who are making money of the reward money should be jailed together with those who plundered the people's money),” Palabay ended. Former Vice President of the United States Al Gore is supporting the United Nations by urging young people across the globe to demand world leaders act on climate change as part of the new Why? Why Not? campaign. The initiative, led by The Climate Reality Project, aims to make climate change a leading voting issue in the world and build support for a binding international agreement on greenhouse gas reductions at the United Nations Framework Convention on Climate Change Conference of the Parties in Paris in 2015. “Climate change is the number-one issue facing humanity today and should be acknowledged as such by our leaders. It is important for the future of our children to ask world leaders “Why?” and “Why not?” and drive our elected officials to act on climate change,” said Al Gore, Chairman of The Climate Reality Project. The Philippines was selected as a target country because Climate Reality believes it to be critical to the international climate change agreement process. In addition to the Philippines, the campaign will also be aimed at Australia, Brazil, India, South Africa and the USA. The campaign will work to recruit young people from around the world, aged between 13 and 21, to be the voices of the generation with the most to lose from the effects of climate change. The campaign will launch a contest inviting young people to film a short video asking leaders a “Why?” or “Why not?” question on climate change and solutions. The creators of the six best submissions will be flown to New York to attend the Climate Summit on 23rd September and be part of a multimedia presentation to world leaders calling for action and ambition on climate change. The deadline for video submissions is September 8, 2014. The campaign will continue to build momentum leading up to the United Nations Framework Convention on Climate Change’s 21st Conference of the Parties in Paris in December 2015, with the aim of creating overwhelming public support for a global agreement on greenhouse gas reductions and climate action. People can show their support for the global Why? Why Not? campaign by joining the community online at climaterealityproject.org, following @ClimateReality, or visiting Climate Reality on Facebook and Google+. QUEZON CITY – Health Alliance for Democracy (HEAD) today will lead various health groups in calling for the abolition of all pork barrel funds and lump sum appropriations like the Disbursement Acceleration Program (DAP) through a mass action that will be held at the entrance of the Philippine General Hospital along Taft Avenue at 4:00 pm. The health group is strongly protesting the continuing implementation of the pork barrel system by the Aquino administration, albeit in other forms, especially in the light of the recent exposé involving health undersecretary Janette Garin. “President Benigno Simeon Aquino III is proving himself to be an incorrigible liar as he continues to undermine the Supreme Court’s decision declaring DAP unconstitutional,” said Dr. Geneve Rivera-Reyes, HEAD secretary-general. According to transcripts of an executive meeting with legislators, Usec. Garin instructed legislators on how the bulk funds of the Department of Health’s Medical Assistance Program can be used for their benefit. Even if the money is with the DOH, it will be the legislators who will decide who can use the funds, virtually giving them control over its use. “The Medical Assistance Program, which is aimed mainly to perpetuate the kind of patronage politics Aquino needs to prop up support for his sagging popularity,” Reyes added. The health group is also condemning all talks on Charter change, especially one that will allow Aquino to have a second term of office. Aquino has openly supported calls to change the Philippine Constitution under the pretext of curbing the power of the Supreme Court. According to Reyes, the DAP should now also be referred to as the “Dictatorial Aspirations of PNoy”. “The Aquino presidency is characterized economically by non-inclusive growth and politically by a wanton betrayal of public trust. Only power-hungry politicians with vested interests will seek to extend such a regime!”, Reyes warned. The group vows to remain vigilant and to continue leading protests against DAP and Charter change. QUEZON CITY – Long before super typhoon Yolanda wreaked havoc in Eastern Visayas that claimed thousands of lives and damage to millions of property, Jovito Palparan’s military-instigated tragedy first struck the region. “I felt a sense of fulfillment, even a little, that Palparan has been arrested. We will look into filing more charges against him. He should account to his crimes in our region and to members of our church as well. We urge all other victims of Palparan to come forward and do the same,” said Emma Lapuz, widow of United Church of Christ in the Philippines (UCCP) pastor Rev. Edison Lapuz. Rev. Lapuz and Alberto Malinao, a leader of local peasant organization, were both shot dead outside the former’s house on May 12, 2005. The pastor was then conference minister of the UCCP and chairperson of Karapatan (Katungod-Sinirangang Bisayas) in the region. Palparan has earned the rank of major general in 2004 when he was appointed commander of the 8th Infantry Battalion of the Philippine Army, covering the area of Region VIII, the provinces of Samar and Leyte. In a span of six months, from February to August of 2005, Palparan and his men unleashed a bloody campaign of terror and mayhem upon the people of Leyte and Samar and claimed 19 victims of extrajudicial killings, 12 victims of enforced disappearances and 25 victims of torture in Eastern Visayas. “The killings in 2005 were intensive and without let-up. Only days and weeks separated the series of murders. Victims were leaders and members of different people’s organizations branded by Palparan as fronts of the Communist Party of the Philippines and New People’s Army,” said Cristina Guevarra, secretary general of Hustisya. On March 14, 2005, Atty. Felidito C. Dacut, regional coordinator of Bayan Muna Eastern Visayas was shot dead by two unidentified men on board a motorcycle. Riding on a multi-cab, Dacut just came from a meeting at the the Bayan Muna regional headquarters in Tacloban. Also, there were nine victims and survivors of frustrated killings. One of them was Dario Tomada, a peasant leader in Leyte, who narrowly escaped an assassination attempt against him inside his house in Kananga, Leyte on May 7, 2005. He and his brother survived the attack. While in a sanctuary in Manila, however, he was arrested in July 2010 and is facing trumped-up charges of multiple murder as one of the John Does in the case along with Jose Maria Sison and Satur Ocampo. Tomada is in detention at the Manila City Jail. “Like what he did in Mindoro, Palparan hamletted communities of farmers and ordinary folks. They were hauled and forced to undergo intensive interrogations, coerced to sign documents incriminating themselves being rebels and made to appear as rebel surrenderees pervaded in the far-flung communities,” said Guevarra. Emma will be joining other victims of Palparan from Southern Luzon and Central Luzon to demand the speedy trial and conviction of Palparan on Friday. “Communities in Eastern Visayas were subjected to food blockades, enforced curfews and regular census by the military. Suspected rebel sympathizers and activists when not being murdered in broad daylight were snatched out and never been heard,” said Guevarra. A protest action will also be held on the next hearing of the kidnapping case against Palparan on August 18 at the Malolos Regional Trial Court. “We join the families of victims of Palparan in Southern Tagalog in seeking justice. Palparan should face dozens of cases not only for the disappearance of Karen Empeno and Sherlyn Cadapan, but also from the extrajudicial killings in Mindoro and other parts of Southern Tagalog when he was commanding officer of the 204th Brigade of the Philippine Army,” Hustisya secretary general Cristina Guevarra said. Palparan, then colonel and later on promoted to brigadier general, led the Task Force Banahaw which was deployed in Laguna and later to Oriental Mindoro. In Oriental Mindoro, there were 39 victims of extrajudicial killings. Some of the victims include couple Expedito and Manuela Albarillo, the Apolinar family (Ruben, Rodriga and Niña), Edilberto “Choy” Napoles, Eden Marcellana and Eddie Gumanoy. These cases were brought before the attention of the United Nations Special Rapporteur on extrajudicial killings Prof. Philip Alston. On October 30, 2008, the United Nations Human Rights Committee concluded that the Philippine government violated the rights of Marcellana and Gumanoy. The UN body also recommended the filing of charges against Palparan. In April 2003, Marcellana and Gumanoy led an 11-person fact finding mission to look into a report of a human rights violation case in Gloria town in Mindoro, Occidental. After the mission they were waylaid by armed men, who were alleged as members of Palparan’s death squad in the island, along the road who took Gumanoy and Marcellana and three others on April 21. The next day, the bodies of Gumanoy and Marcellana were found in a ditch in Bansud, Mindoro Oriental. At the time of their deaths, Marcellana was secretary general of Karapatan-Southern Tagalog Region while Gumanoy was chairperson of Katipunan ng Samahang Magbubukid sa Timog Katagalugan (Kasama-TK), a regional peasant alliance. The family of Eden Marcellana today led the protesters in front of the NBI and vowed to pursue the cases against Palparan. Orly Marcellana, husband of Eden, filed thrice at the Department of Justice. All three complaints were dismissed by the DOJ for lack of evidence against Palparan and his men. On Friday, victims and kin of victims of Palparan will gather at Balay Kalinaw, University of Philippines-Diliman for a press conference. “We are calling on all victims to come forward. More cases should be brought against Palparan for the heinous crimes he has committed,” Guevarra said. QUEZON CITY – With the arrest of 52 more foreign workers allegedly working without valid working permits in Davao City last week, the Trade Union Congress of the Philippines (TUCP) urges the Senate and the House of Representatives to act on their pending resolutions calling for a probe in aid of legislation on the matter. “There is indeed a clear, continuing and growing violation of our domestic laws. The increasing incidence of migrants working in the country without necessary government working permits and without fulfilling other requirements for alien workers has very serious adverse implications not only in the local construction industry, fishing, mining and other industries, but also in the current employment and underemployment situation in the country. This further undermines the job security in the country, as they compete with the already limited jobs generated for the Filipinos in our homeland,” TUCP spokesperson Alan Tanjusay said. For not having valid working permits, the Bureau of Immigration (BI) rounded up last week 50 Chinese, one British and one Australian working in the construction of coal-fired power plant Therma South Inc., a wholly-owned subsidiary of Aboitiz Power Corporation. There is also a need to investigate Aboitiz Power Corporation on how were they able to hire the foreigners amid the existence of the law. In December last year, the BI detained and deported more than 200 foreign workers working in construction sites in Bataan and Batangas provinces after they were discovered to have without working permit. But on one hand, Tanjusay stressed that the probe, if ever, will also benefit migrant workers in terms of labor standards and working conditions. Illegal migrant workers, he explained, are vulnerable to violation and exploitation of their basic rights as workers as they cannot be provided protection by our laws. “They are susceptible to being abused for reasons such as their lack of capacity to speak and understand the Filipino language and other exploitative working conditions such as unjust compensation given to them. They should enjoy the freedom from this worst form of modern-day slavery,” Tanjusay said. Senator Miriam-Defensor Santiago filed Senate Resolution 288 in December 2013 and TUCP Party-list Rep. Raymond Mendoza filed House Resolution 974 on February 2014 to conduct an inquiry aid of legislation on the said matter but neither happened. Philippine unemployment rates have remained static on the average of 7% the past years. According to the April 2014 Labor Force Survey, the unemployment rate was at 7.0% or 2.924 Million of the total labor force of 38,172,006, excluding the typhoon Yolanda stricken areas while 18.2% or 7.0 Million were underemployed, and about 36.9% or 1.078 Million of the unemployed are were college undergraduates and graduates. The World Bank, through its Philippine Development Report (PDR) released in September 2013, estimates that about 10 million good jobs are needed to be generated per year which includes jobs for about three (3) million people who are unemployed and seven (7) million who are underemployed, and that the government also needs to create employment for another 1.15 million new entrants to the labor force every year from 2013 to 2016. On the average, the government can only generate about 240,000 new employment opportunities annually which leave most job-seekers with no choice but to either seek employment abroad, remain unemployed, go back to school, or rely on financial support from employed family members for the time being. “We clearly reiterate that TUCP is not against the entry of foreign workers in the country, but of the adverse impact on our very own workers who are being deprived of potential employment and livelihood opportunities,” Tanjusay added. Foreign nationals must go through the due process legally mandated by the laws. Under the Department Order No. 12 (Series of 2001) known as the Omnibus Guidelines for the Issuance of Employment Permits of the Department of Labor and Employment, all foreign nationals seeking employment in the Philippines are mandated to apply for an Alien Employment Permit (AEP). CAMP LUKBAN, Catbalogan City, Samar – Troops under the 8th Military Intelligence Battalion recovered one (1) M16 rifle, one (1) long magazine with live ammunition and a medical kit with assorted medicines, 1-syringe, dextrose and gloves at the vicinity of Barangay San Miguel and Barangay San Francisco, both of Las Navas, Northern Samar on August 11, 2014 at 6:35 p.m. According to the report received by this Headquarters, the recovered firearm and Medical kit were discovered by a concerned citizen along the withdrawal route of the New People’s Army members after an encounter with government troops on July 31, 2014 at Barangay San Miguel, Las Navas, Northern Samar. The concerned citizen later reported the location of the firearm to Headquarters 8th Infantry Division which mobilized the 8th Military Intelligence Battalion that recovered the firearm. More troops were dispatched in the areas near Barangay San Francisco and Barangay San Miguel to pursue the rebels who were reported to be hiding in their hideouts near the said barangays. QUEZON CITY – A broad network of peace advocates, Kapayapaan - campaign for a just and lasting peace - welcomed the arrest of retired Army Gen. Jovito Palparan Jr. and expressed hopes that justice would soon be served to victims of human rights violations. Dr. Lito Manalili, former Dean of the UP College of Social Work and Community Development and one of the convenors of Kapayapaan, said that the arrest of the military official linked to gross human rights violations shows that there are still patriotic and democratic elements in state security forces who uphold the rule of law. Palparan was arrested early morning of August 12 by elements of the National Bureau of Investigation (NBI). A warrant of arrest was issued against him in December 2011 for charges of kidnapping and serious illegal detention in relation to the enforced disappearance of University of the Philippines (UP) students Karen Empeno and Sherlyn Cadapan. “This is a good step but there is a long way to go to make Palparan accountable for all the human rights abuses he committed against activists and civilians,” Manalili said. Besides the Cadapan-Empeno case, Palparan was identified as the mastermind behind the killings of Southern Tagalog human rights defenders Eden Marcellana and Eddie Gumanoy in April 2003. Palparan is also implicated in the hundreds of cases of extrajudicial killings in Eastern Visayas, Central Luzon and Southern Tagalog where he was assigned during the administration of President Gloria Macapagal-Arroyo. Kapayapaan noted that former United Nations special rapporteur on extrajudicial, summary and arbitrary executions, in his visit to the Philippines during Arroyo’s term, attributed the extrajudicial killings to the Philippine government’s counterinsurgency program. Instead of reversing the policy and practice of gross human rights violations, Arroyo went to the extent of publicly praising Palparan in her 2006 State of the Nation Address. Kapayapaan said the Government of the Philippines (GPH) must uphold the Comprehensive Agreement on Respect for Human Rights and International Humanitarian Law (CARHRIHL) and punish Palparan for crimes in violation of the landmark agreement in the peace negotiations. QUEZON CITY – "Families of the disappeared should see Maj. Gen. Jovito Palparan in Malolos Court on Monday, August 18, in the hearing of the case against him. There is no reason why he should not be there," said Lorena “Aya" Santos, secretary general of Families of Desaparecidos for Justice. "While we welcome butcher Palparan's arrest, we remain more vigilant to see through that justice be served soon," Santos said. Palparan is currently facing charges of kidnapping and serious illegal detention at the Malolos Regional Trial Court for the abduction and disappearance of University of the Philippines students Karen Empeno and Sherlyn Cadapan in 2006. Palparan is accountable for at least 59 victims of enforced disappearances: five victims in Mindoro, 42 victims in Central Luzon, and 12 in Eastern Visayas. "Palparan's arrest comes in such a convenient timing to pull up BS Aquino's falling trust ratings," Santos said. "As BS Aquino is being made accountable for the unconstitutionality of the Disbursement Acceleration Program (DAP) and many other issues, the National Bureau of Investigation (NBI) arrested one of the most wanted men who have eluded arrest for more than two years; and, eight years after the Karen and Sherlyn were abducted, tortures and disappeared," Santos said. "Let this be not an attempt to gain pogi points for BS Aquino government. It is because of the courage of the mothers of Karen and Sherlyn and the popular call of the people for justice that Palparan, Lt. Col. Felipe Anotado and Sgt. Edgardo Osorio are now face charges in court," Santos said. M/Sgt. Rizal Hilario, also a co-accused in the case, remains to be a fugitive. "We demand that Palparan be imprisoned in a regular jail and not in a military custody," Santos ended.